Note: Always use safety protection. Such as gloves and goggles. It’s also best to have someone else around when cutting to help hold things steady. 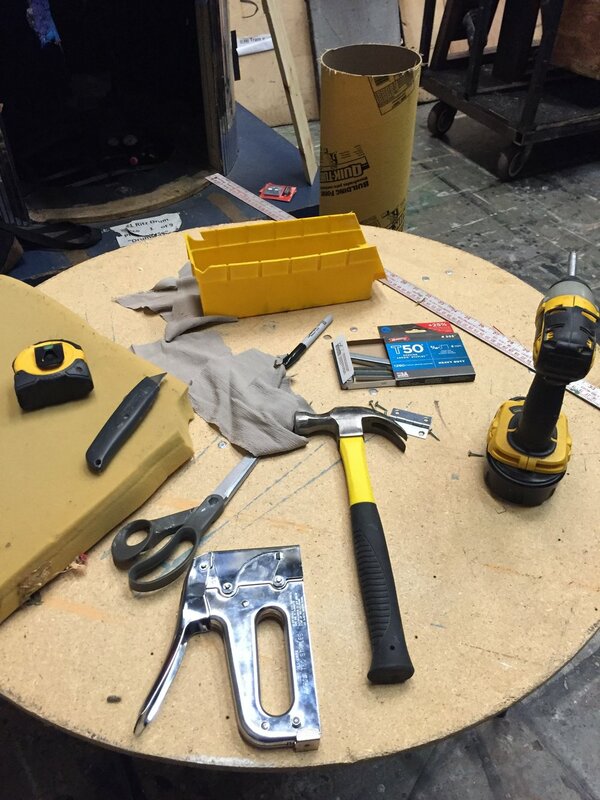 Here is a picture of most the tools I used. 1. Decide how call and how many mushroom stools you want. I have 3 nephews, so there are 3 stools. 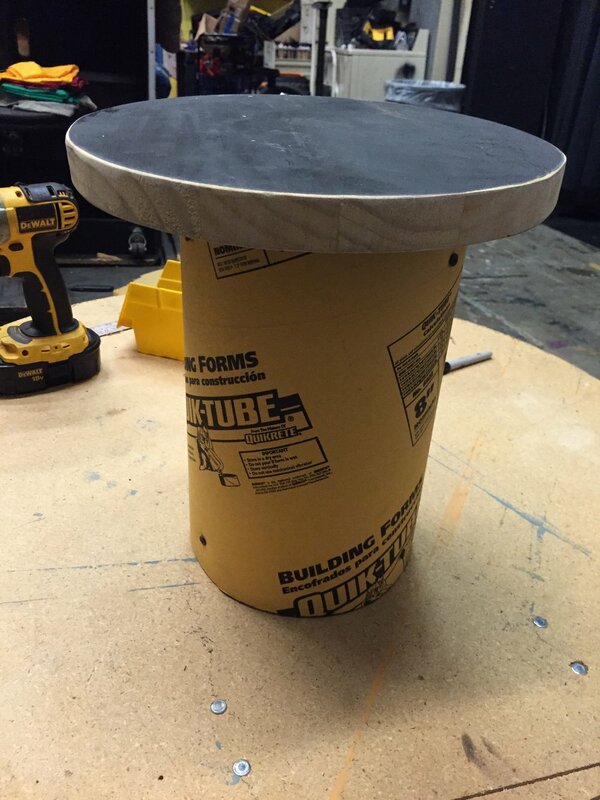 Use a ruler to make a line around the Concrete Form at 12″. Use the Circular saw to cut the Form. I Jug Saw can also be used, but will not get as straight a line around. You can see the concrete form standing in the back right of the picture above. 2. Cut 3 pieces of the 1×3 at 1′ each. Or whatever height the stools were cut to. 3. Screw the 1×3’s to the inside of the concrete form. I used 2 screws each. Space them out. This will add extra support for the stool to be sat on. And give you something to screw the top and base into. 4. Place the concrete form on the piece of luaun. Trace the outside of the form. Cut it out with the jig saw. Sand the sides to get rid of any splinters. 5. Place the luaun circle on top of the concrete form. You should know where the 1×3’s are, due to the screws in the side. Screw the piece of luaun to the concrete form. 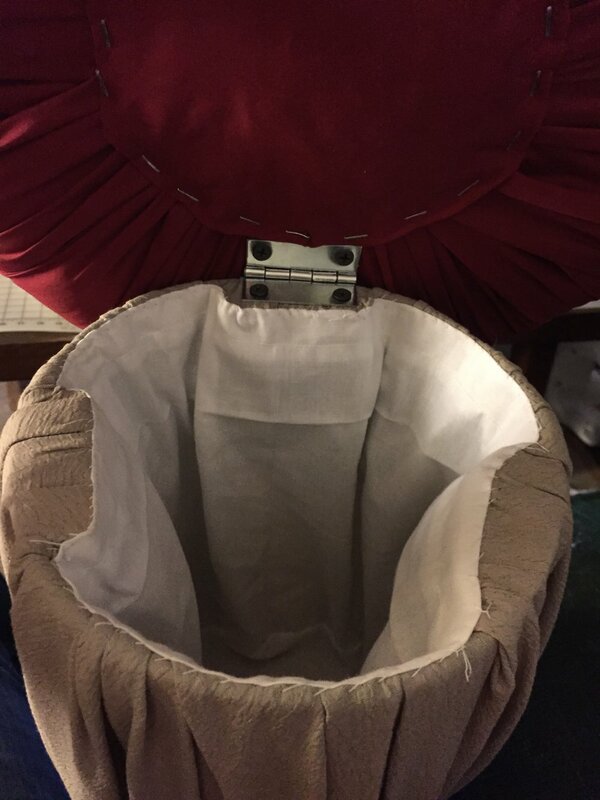 Make sure the screws are sunk in so they don’t rip the fabric cover later. 6. Time to wrap the bottom of the mushroom! Choose a fabric, preferable something thinner since there will be a lot of gathering. Lay it on a flat surface. Now time to calculate how large of a circle you will need. You can do this the math way, or the visual way. 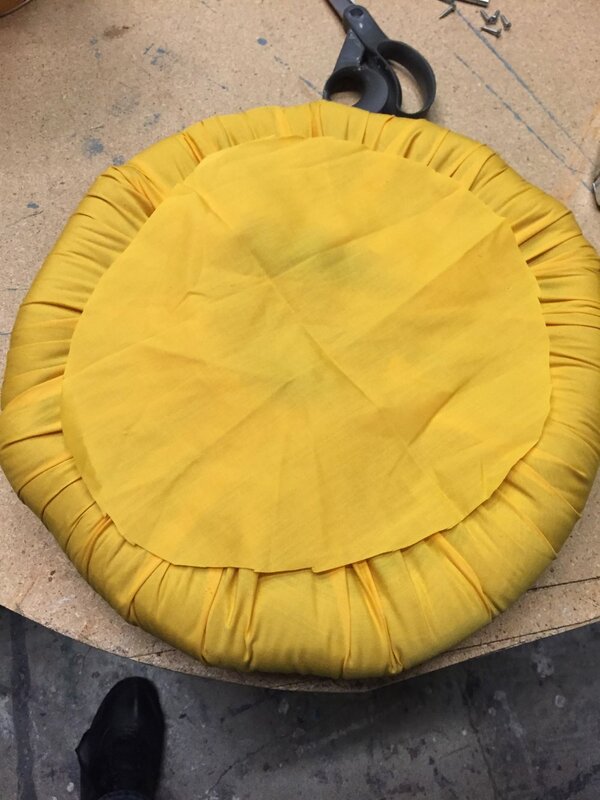 Math way: diameter of concrete form + (2*(height of the form)) + 6″ = Diameter of fabric. Visual way: lay concrete form on fabric edge, roll to stand it up on end, roll to lay it on other side, add the width of your hand. Kind of like wrapping a present. 7. Draw a circle. Again, you can estimate it, or you can take the radium (1/2 the diameter) and find a middle point, tie a pen to a string at the length of your diameter, and draw a perfect circle that way. It is not important that it is perfect. That is why there are 6″ extra to fold into the top. I had a table almost exactly the size I needed, so I used the table as a measure, and cut the fabric around the table. 8. Place the concrete form (solid side down) in the middle of your circle. Gather all of the fabric and shove it in the concrete form. 9. Start one one section, gather the fabric in the area, use the stapler and staple it down. Then go to the opposite side, pull tight against the staple, and staple again. This will keep the fabric from moving around too much on you. Work around the inside of the form and staple it down. I put a staple every inch or so. 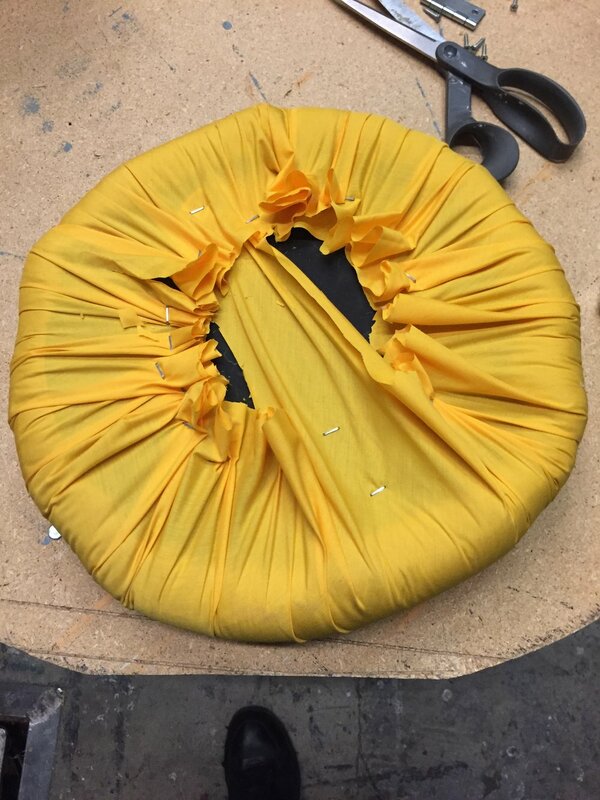 If the fabric is too thick, you might need longer staples. 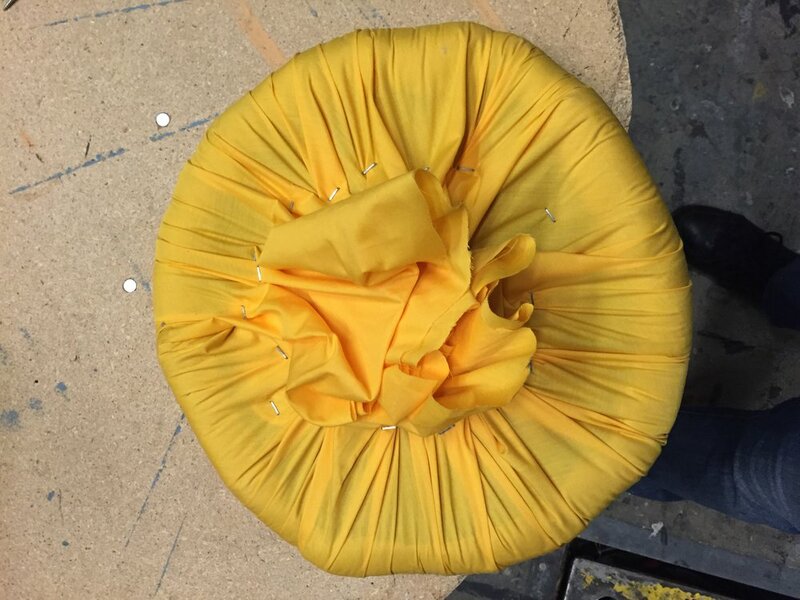 If the fabric is really thin, get smaller staples. 10. The base can be finished at this point. I knew kids were going to be playing with it, so I created a bag out of cotton fabric that I sewed to the inside of the concrete form. This made the inside look cleaner and kept splinters and staples away from the kids hands. 11. Time for the top of the mushroom. 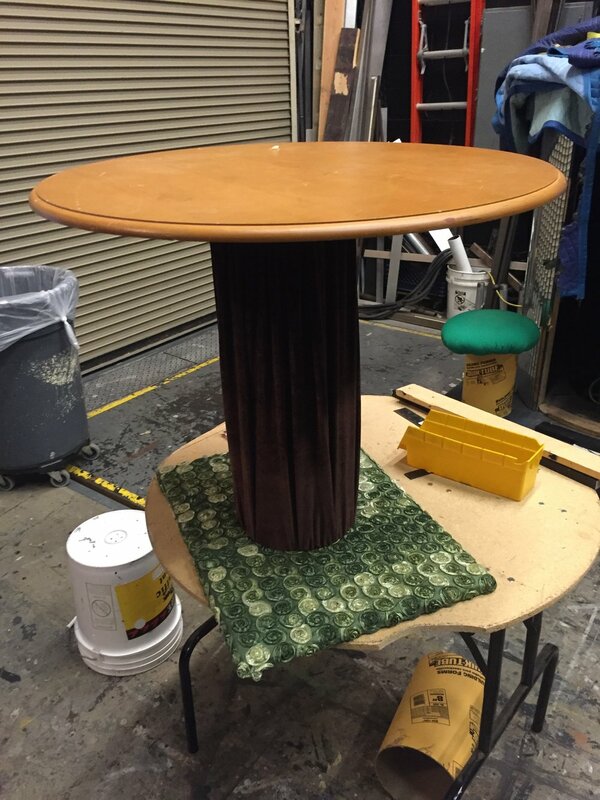 Get the concrete form (or base of the mushroom) and the piece of plywood. 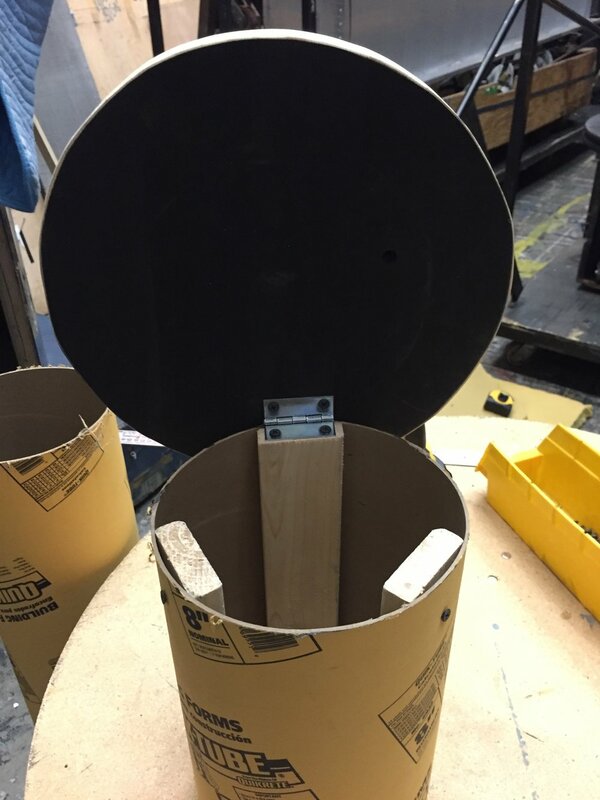 Draw a circle on the plywood that is about 2-3″ wider than the mushroom base. Cut out the plywood with the jig saw. Sand the sides to keep splinter down. 12. 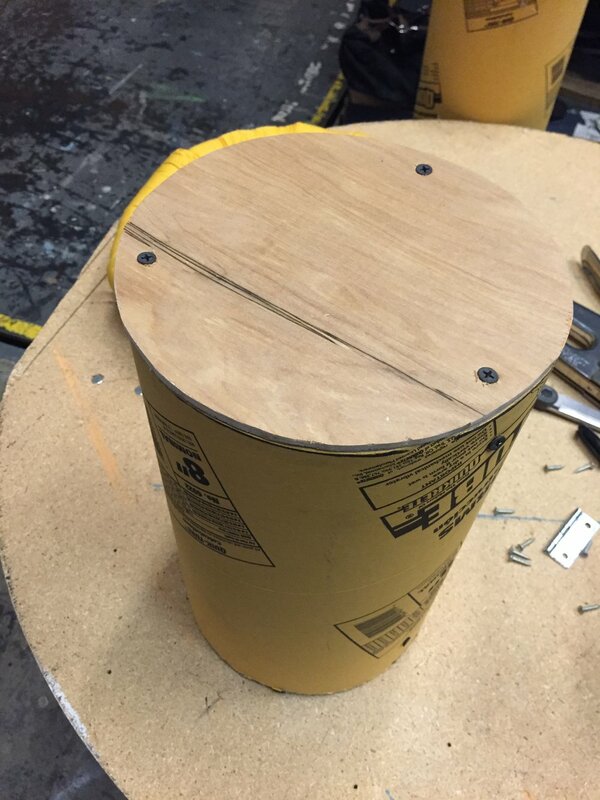 Lay the plywood circle on the piece of foam. 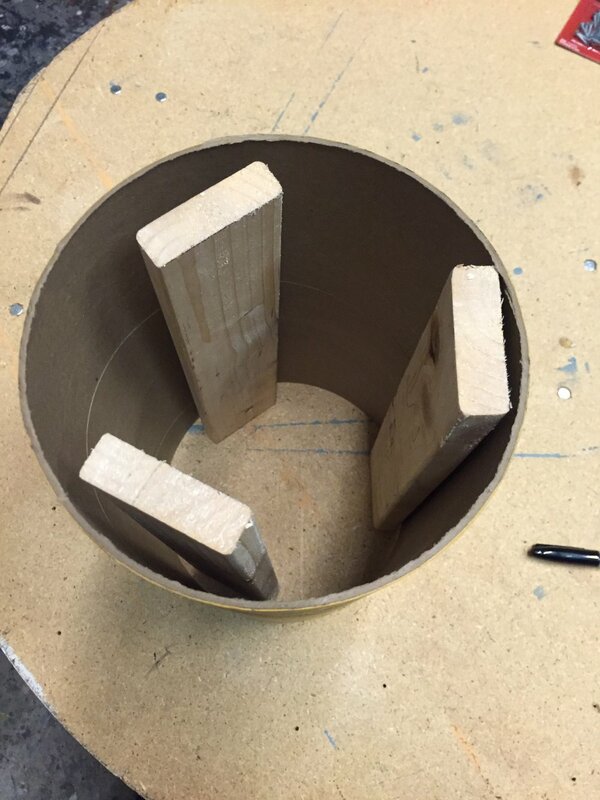 Again, draw a circle about 2-3″ wider than the plywood. Use the utility blade to cut out the foam. 13. 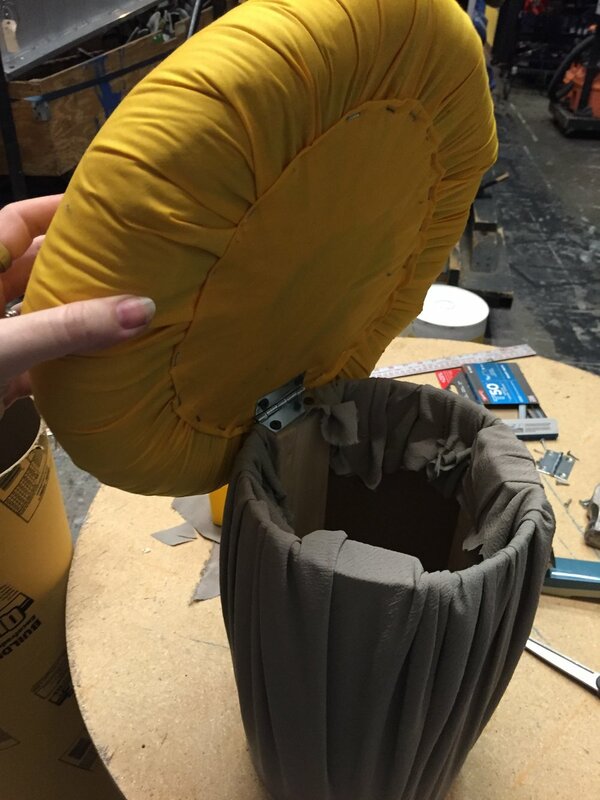 Lay the fabric down, lay the foam on top, draw a circle about 4-5″ larger than the foam. Cut out the fabric. 14. Back to the staple gun. 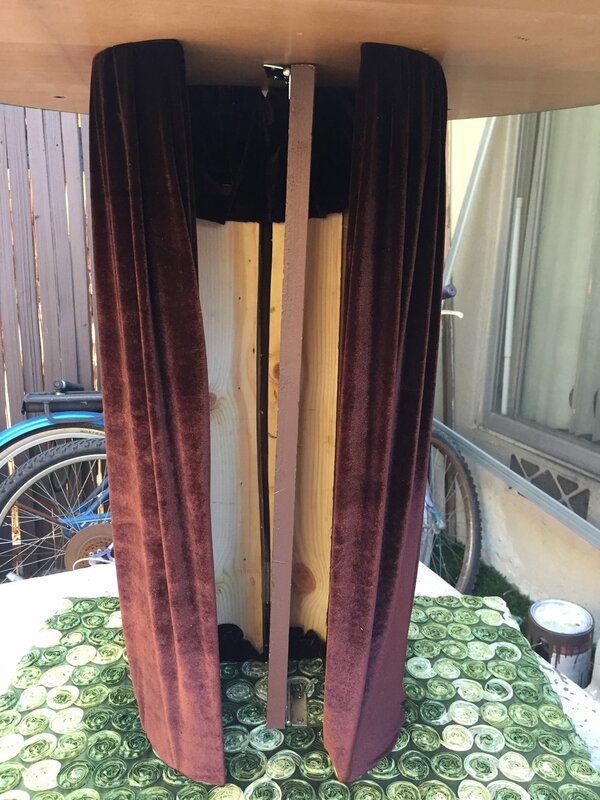 Grab a piece of the fabric and pull it towards the middle of the plywood. Use your staple gun, and staple it down. Turn the mushroom top 1/2 way around, and do the same to the other side. Make sure you pull hard against the staple. 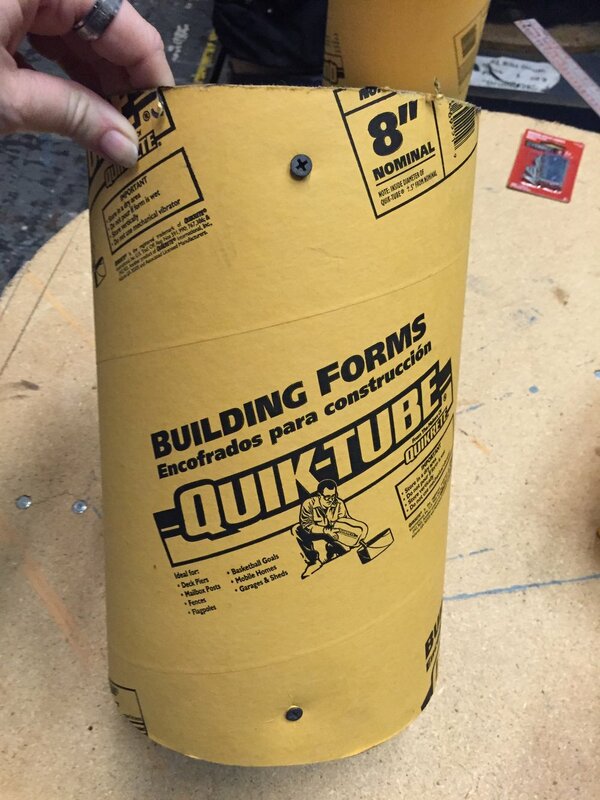 This will keep the plywood and foam in place while you work your way around the circle. Always pulling tight and stapling. 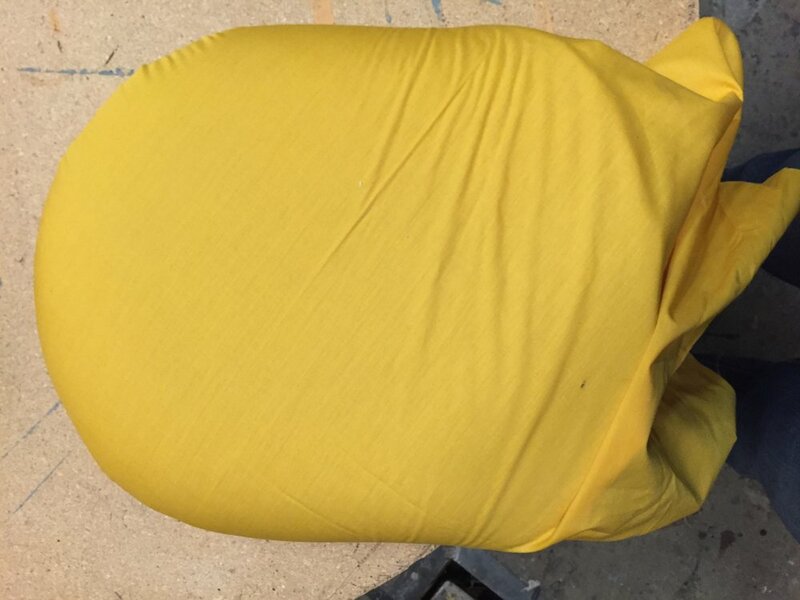 If your fabric does not go all the way to the middle, good. If your fabric is too long, and bunching up too much in the middle, take the scissors and cut it back. 15. Another circle! 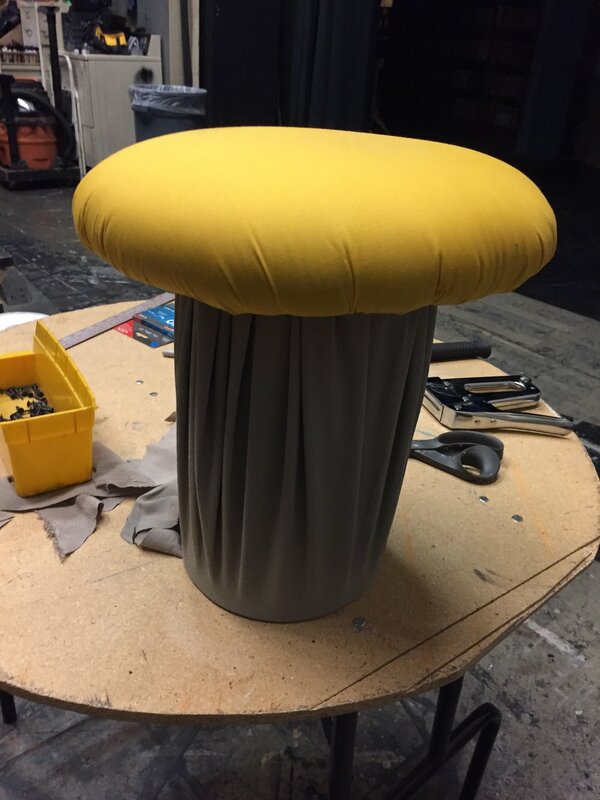 Lay the scrap cloth over the bottom (staple) side of the mushroom seat. 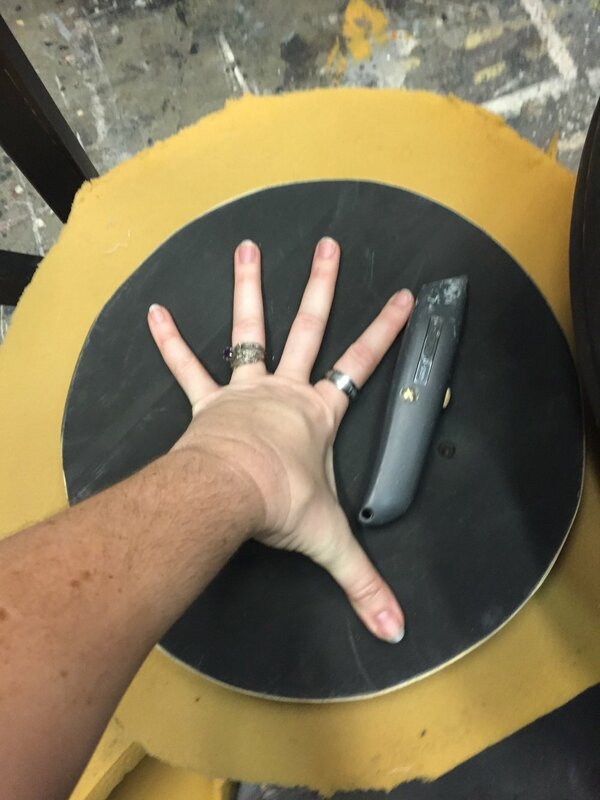 Draw a circle that does not go to the edge of your seat, but covers all the staples. Cut out this circle. 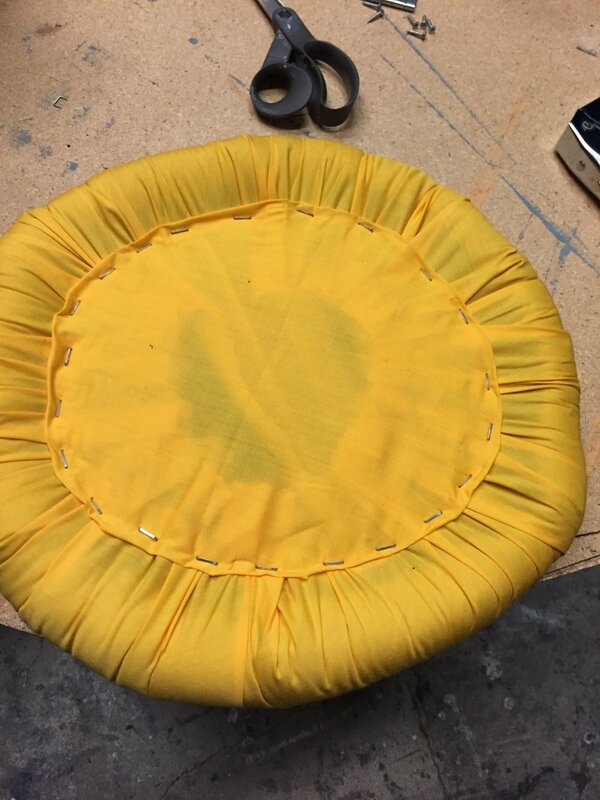 Lay the circle back on the seat and staple it around all the edges. Make sure to turn under the outside edge of the circle. 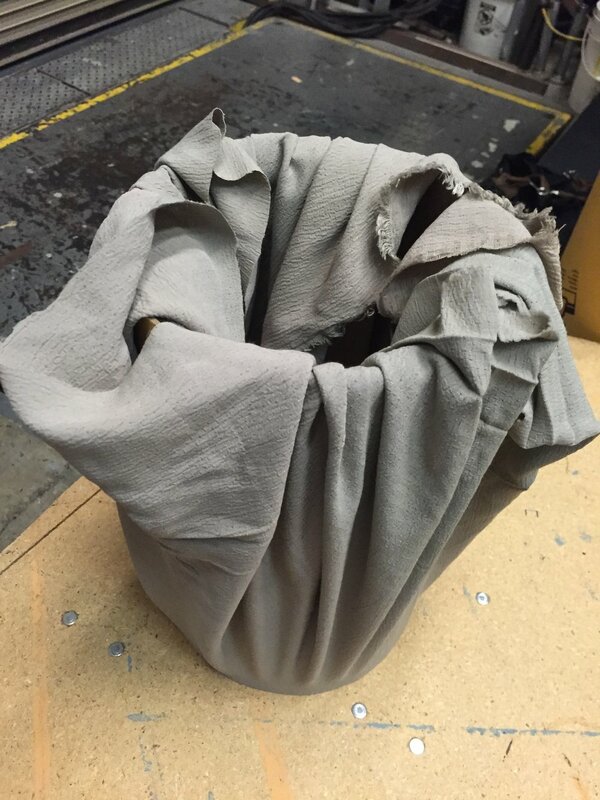 You don’t want to see the raw fabric. 16. Time to attach the two pieces. Get a hinge, no larger than the 1×3 used inside the form. Screw one side of the hinge into one of the 1×3’s in the form. Place the seat on its face, so the plywood is facing up. 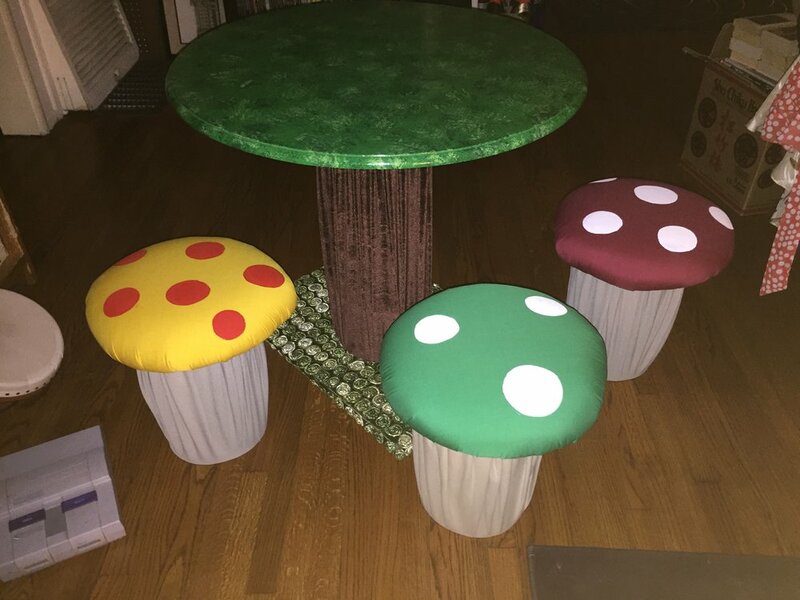 Place the bottom of the mushroom on the seat. 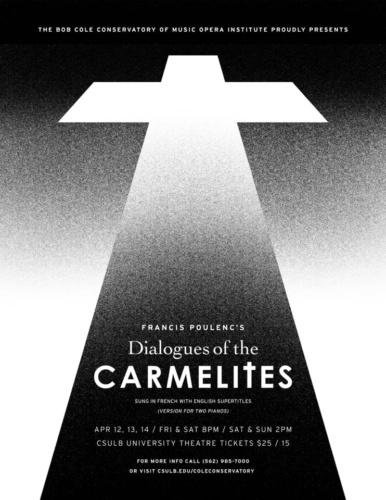 Try to make it as centered as possible. Slowly lean back the base so you can get your hand under it and find the hing and hold it into place. Screw the hinge to the mushroom seat. 17. 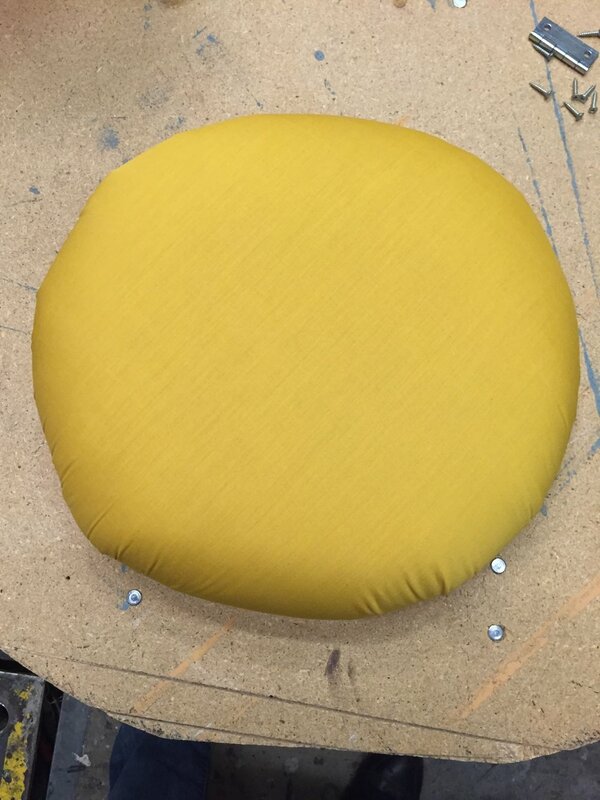 Paint circles on top of the seat. I went with Mario Brother’s colors. 18. Scotch guard everything! There is no way to easily clean these, so I put a few layers of Scotch guard on everything to try to keep them as clean as possible. 19. Table time. Much easier! Lets start with a base. Choose anything! I used a 1/2″ rectangle piece of plywood. Because I had that in my shop and was tired of circles. Sand all the edges so there are no sharp areas. 20. Choose a fabric or to paint it. I chose fabric because I loved the texture of this fabric and thought kids would like to touch it too. Lay the fabric face down and put the wood on top. Use the staple gun to attach. Again, pull tight and use plenty of staples. If any of the staples do not go in enough, use a hammer. This is sitting on the floor, so need to ruin the floor with a staple sticking out. 21. Decide the height of the table. I chose 2′ since my stools are 1′ (not taking into account the plywood and foam, but that is ok). Cut 5 pieces of 1×3 and 1 piece of the concrete form at that height. 22. Take the concrete form and cut it in 1/2 up the long way. When you are done, you will have two half pipes. I used a circular saw to make it as straight as possible. Sorry, I forgot the take pictures of most of this process. 23. Screw the 1/3’s to the concrete for so they line up with the edges. Meaning when you put the concrete form back together, the pieces of wood will be touching. 24. Choose a side. Screw a hinge to the top and another to the bottom of the form 1/2s on the outside. The plywood is there to give the form strength for the hinges. 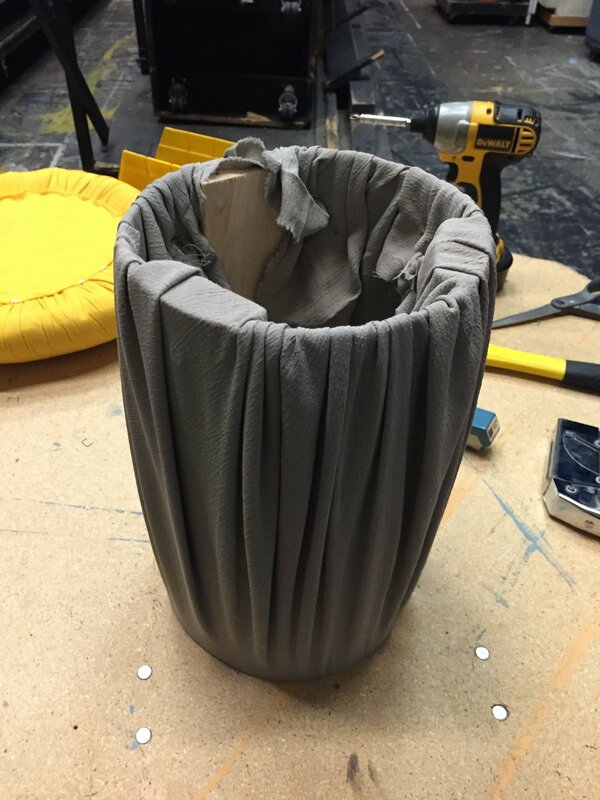 You want the concrete form to be open so you can see the inside, and close, to hide the support for the table. 25. Choose a fabric for the tree trunk. I went with a dark brown crushed velvet. This time it does not need to be a circle. 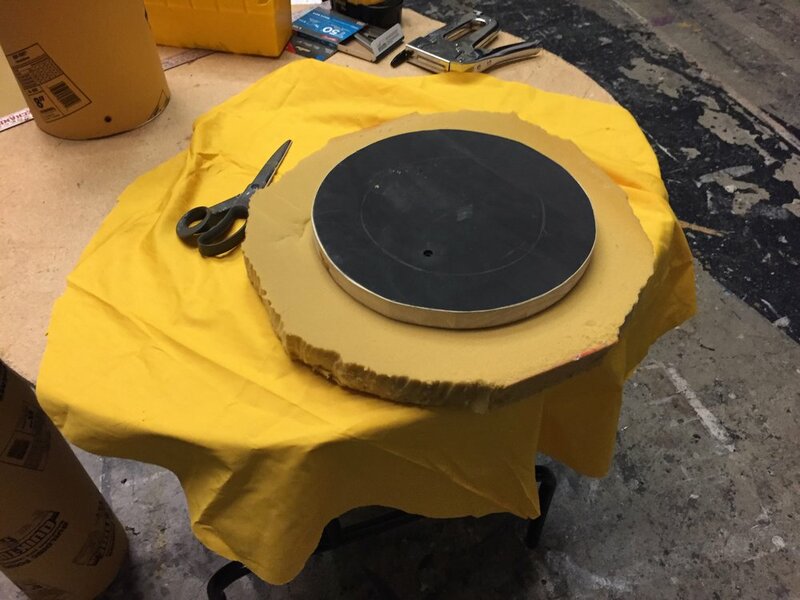 Get a piece that is a rectangle, about 2 times longer than the circumference (around the outside of the circle), and about 6″ taller than the form. 26. 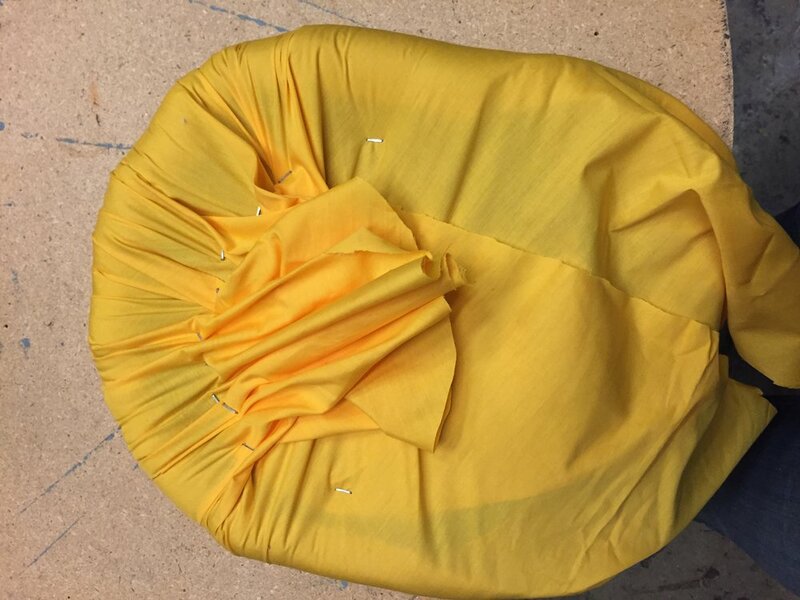 Find the middle of fabric staple it to the hinge section of the form. Both at the top and the bottom. 27. 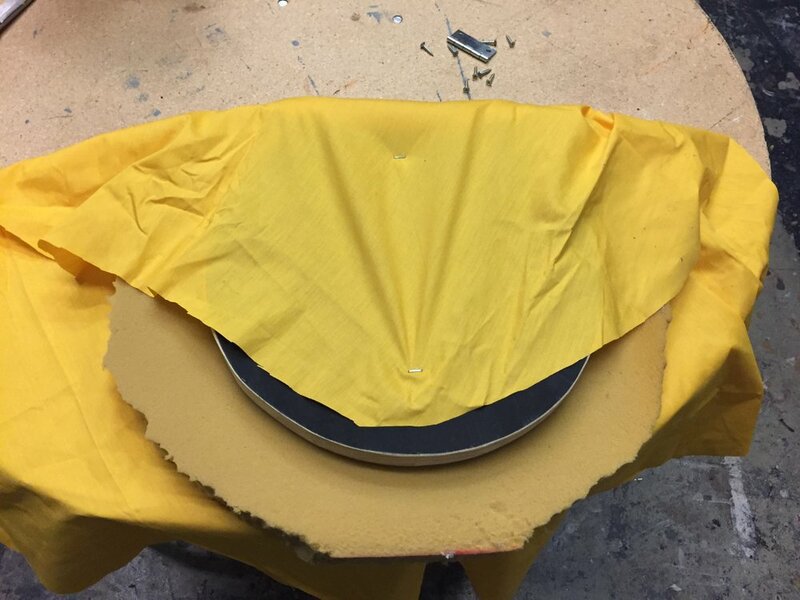 Get the end of the fabric, wrap it about 1″ around the cut section of the form, and staple it down. Both the top and the bottom. 28. Finish gathering and stapling the fabric around the form. 29. The table top. I had one in stock from an old project. 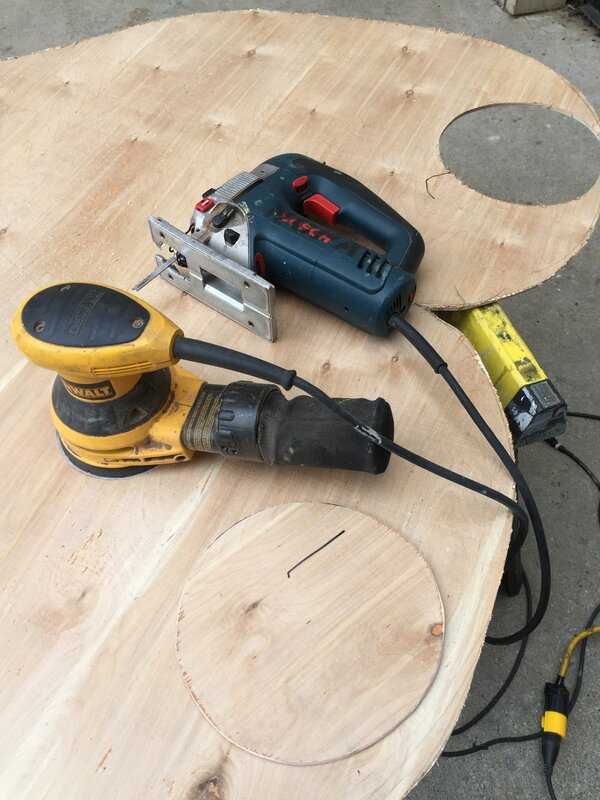 But if you don’t, decide how large you want the table to be, draw a circle (direction on # 7), cut out with a jig saw, and sand all sides. 30. Take the remaining 1×3 and attach a hinge to both sides. Make sure they go opposite ways. The plan is that it will fold up on itself if it does not have the concrete form around it. See picture above if this is confusing. 31. Find the middle of the base and the middle of the table top. Attach the other 1/2 of the hinges. This part is probably easier to do with 2 people since its hard to hold up a table and 1/3 while trying to sink a screw in. 32. Open the tree trunk, and slide it around the 1×3. Close the tree trunk. Now the table will stand on its own. 33. 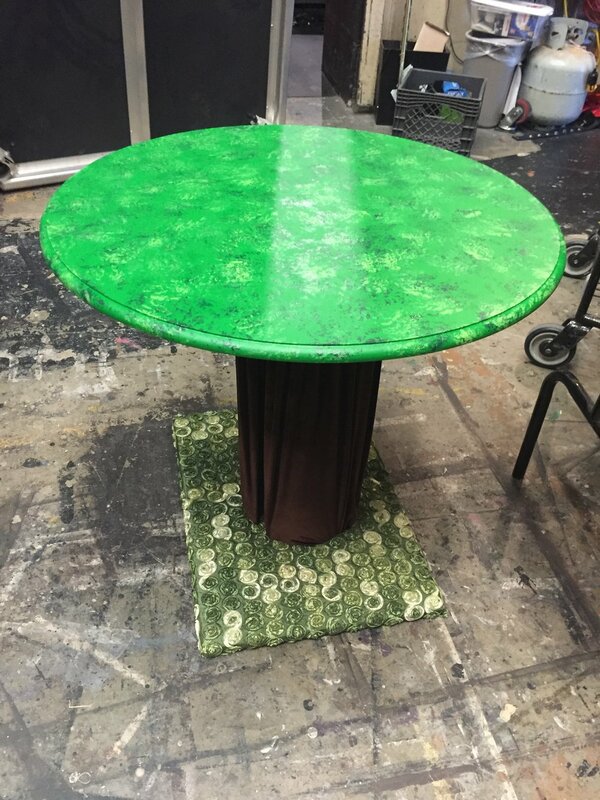 Paint your table top! I rolled on a medium green paint. Then sponged on a darker and lighter paint to give it texture. Again, since kids were going to be playing with it, I added 3 coats of a clear varnish to seal everything and make it easier to clean.